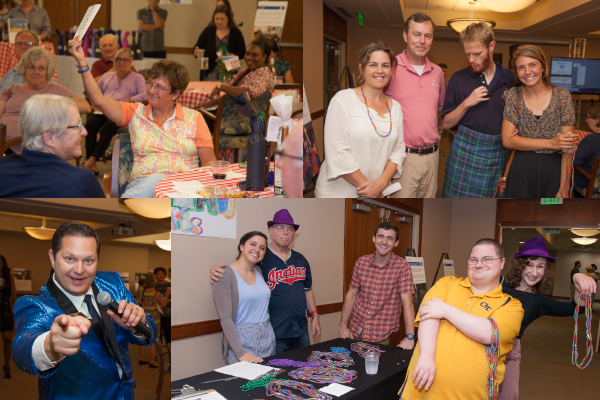 We invite you to participate in our Fifth Birthday Benefit & Bash, our annual fundraising celebration hosted by the Advisory Council of L'Arche Atlanta. This exciting event will be attended by generous Decatur and Atlanta-area individuals and corporations who support people with intellectual and developmental disabilities. Individuals, corporations, and community groups are invited to support this fundraising event with the purchase of sponsorship packages ranging from $1,000 - $10,000. Sponsor package benefits include tickets to the celebration, as well as recognition at the event and in related advertising and promotional materials. For more information on sponsorships, see the link to our sponsorship packet on the right panel or contact L'Arche Atlanta Office Manager Rita Haggerty at rita@larcheatlanta.org. Interested in donating to the auction? Contact L'Arche Atlanta Board Member Michelle Hall at mhall@oglethorpe.edu. L'Arche Atlanta is an Atlanta-based nonprofit that supports people with intellectual and development disabilities (IDD). In the L'Arche Atlanta community, people with IDD (whom we call core members) are not clients, patients, or recipients of services. Instead, they are friends, teachers, and companions, who, through daily acts of care, trust, and friendship, develop into ambassadors of compassion and leaders for social change. L'Arche Atlanta launched its first house in 2012 in the Oakhurst neighborhood of Decatur and became the 140th organization in the International Federation of L'Arche. L'Arche was founded in 1964 as a response to the mass institutionalization of people with intellectual disabilities and has since spread to over 140 communities in 35 countries. For over 50 years, L’Arche has brought about a revolution in quality of life for people who have developmental disabilities.